We landed at Phuket’s upgraded international airport late at night and departed first thing the next morning. 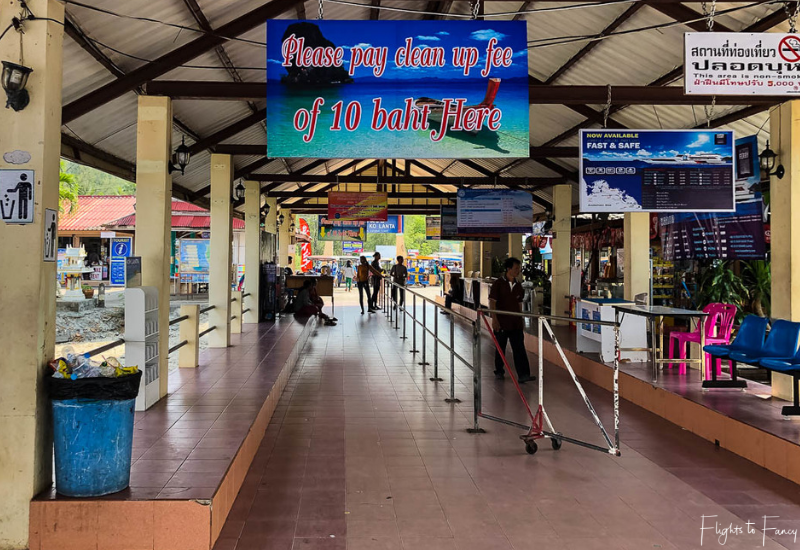 From our previous trips to Koh Phi Phi we know just how crazy Rassada Pier can be and we didn’t fancy just turning up and taking a chance so we booked ahead. 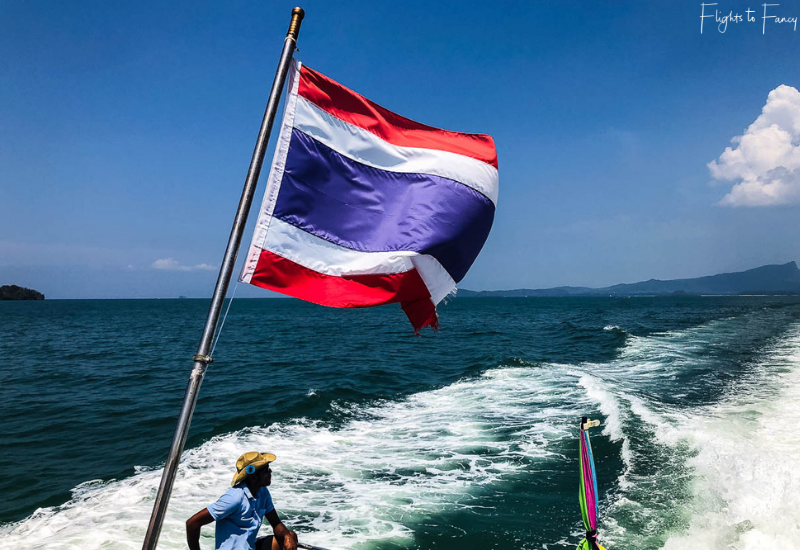 When travelling between Phuket and Koh Lanta, visitors have a choice between a speedboat which takes about 1½ hours or a ferry which takes about 4 hours. You could, in theory, travel by land for about 4 hours to Krabi and zip across from there, but why would you want to? 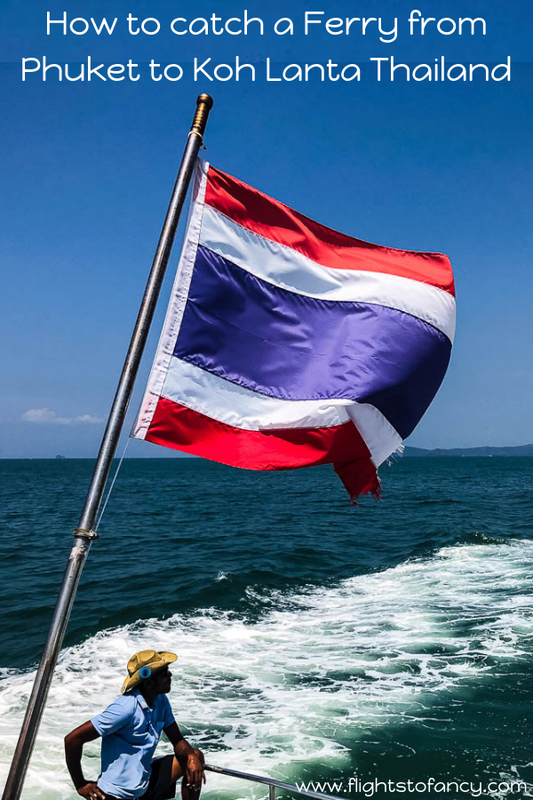 The ferries from Phuket to Koh Lanta are not direct and go via either Koh Phi Phi or Krabi and sometimes involve changing boats. There are multiple operators of both and of course the speedboats are more expensive. Booking Phuket transport online is a bit of a minefield. There are a heap of dodgey looking websites with widely varying prices and it’s hard to tell which ones are legit, but I wasn’t simply looking for the cheapest price. I was also looking for an easy, safe journey and a reputable agency. I looked at Phuket Ferry first. The website kept glitching and was incredibly slow. After a few attempts (and several browser warnings) I discovered they had five options leaving at 8.30am, two speedboats priced between AUD$48 – AUD$52 per person and three ferries between AUD$30 – $32 per person. Nowhere during the booking process did Phuket Ferry state which carrier the tickets were on. There is a picture of the vessel so you can sort of work it out if you know what they look like, but it didn’t sit well with me not knowing exactly what I was getting so I moved on. Direct Ferries were my next stop. They had four options leaving at 8.30am from Rassada Pier heading to Saladan Pier; three speedboats and one Koh Lanta ferry. Direct Ferries did state the carrier and the speedboats were run by Bundhaya, Satun Pakbara and Tiger Line (between AUD$68 – AUD$72). The Koh Lanta ferry was operated by Phi Phi Cruiser (AUD$46). The itinerary for the ferry was not provided and it did not state where the route went and whether a boat change was required. I moved on. Next I decided to check the major online bookers Viator, Get Your Guide, 12GO and Klook. Viator offered the Satun Pakbara speedboat for ~AUD$74 and the Ao Nang Princess Ferry for ~$43. 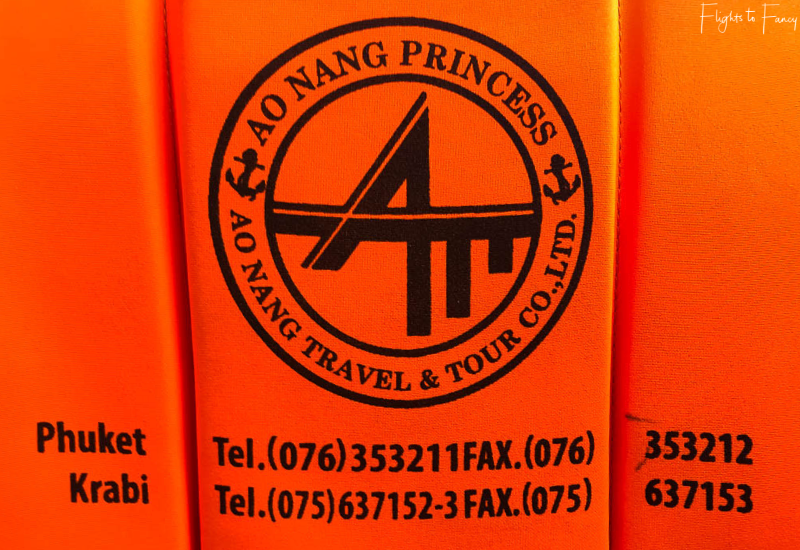 Viator offered a little more information and stated that the Ao Nang Princess ferry travelled via Ao Nang and Railay Beach and there was no need to change boats. Things were looking up. I had pretty much decided at this point that the Ao Nang Princess ferry was the one I would book. Get Your Guide had the same trip for ~AUD$42 and 12Go were out of the mix at ~AUD51. We decided to book with Klook because they were the cheapest at only ~AUD$34 and we have used them many times before without incident. 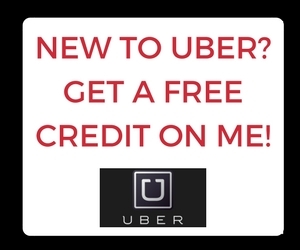 A free hotel pick up was included in selected areas (Phuket town, Patong, Karon and Kata). 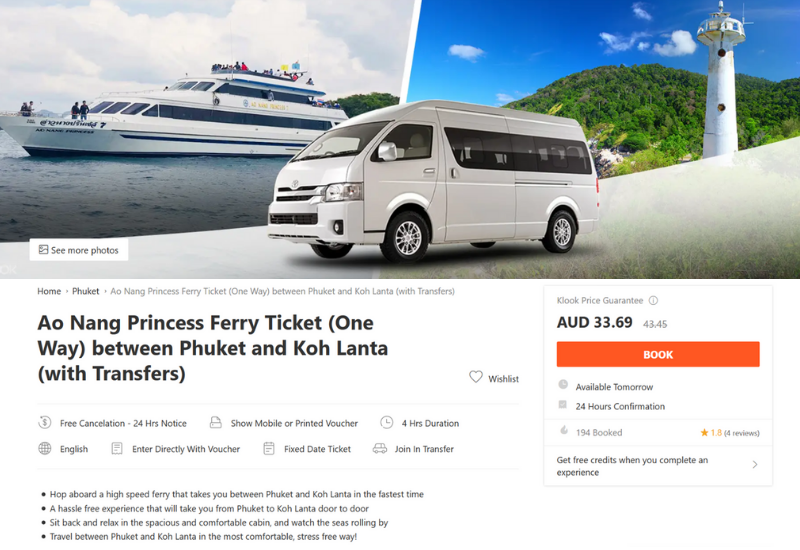 Book your own ferry from Phuket to Koh Lanta with Klook here. While Klook does issue electronic vouchers, I always print a copy just in case I have any issues with my phone or connectivity. It’s better to be safe than sorry. If you prefer the faster ride of the speedboat, try this one. We wanted to stay as close as possible to Rassada Pier to lessen the travel time in the morning. Phuket Town is only 10 minutes away and we booked a deluxe room at the Me Room Hotel for the bargain price of AUD$50. Our ferry from Phuket to Koh Lanta came with a free hotel pick up and our Klook voucher stated we would be collected at 7.45am. The driver was right on time. The transfer was in a shared van and we were the first to be collected. First impressions count and our driver didn’t impress. He was extremely abrupt and we noted there was a baseball bat tucked underneath the seat 😯 😯 😯 We picked up 6 more passengers along the way and the driver was equally short with them. He spoke about ten words the entire trip, five of which were ‘watch your head’ and ‘number 7’ when we arrived at Rassada Pier. I tried to clarify if everyone needed to go to kiosk 7 giving we were all going to different places, but I was ignored. I gave up trying and figured we would work it out ourselves. Rassada Pier was a hive of activity in the early morning. Multiple boats were moored and their passengers were all milling around the various check in counters. Kiosk 7 was the last kiosk on the left as you are facing the water. Of course it had the longest queue. Things don’t always run smoothly in Thailand so I was pleasantly surprised to find the staff were very efficient in dealing with the throng (and much more pleasant than the driver!). I was glad I had my printed voucher as it made it much easier to check in. 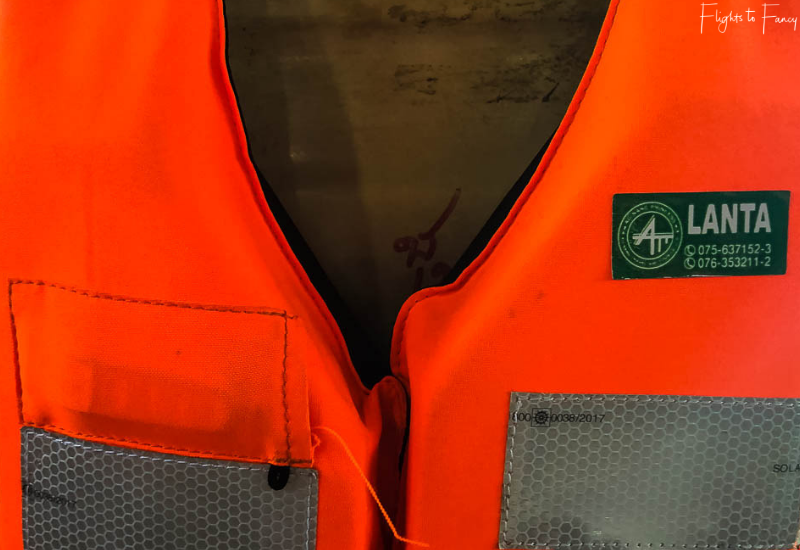 Our bodies and bags were tagged with stickers proudly emblazoned with ‘Lanta’ and we were handed two gate passes. Rassada Pier has limited seating and a few small stalls selling snacks and drinks. There is not a lot to keep those waiting amused so I wouldn’t recommend arriving too early. Rassada Pier has two departure gates and we were directed to gate 2 on the right hand side when facing the water. As we passed through the gate the staff were checking the stickers folks were wearing and directing them accordingly. We were directed to the far left. Rassada Pier was so crowded with vessels that multiple boats were docked at every berth. Our boat, Ao Nang Princess, was docked three deep, meaning we had to walk across the first two boats to board. As I watched my fellow passenger struggle to carry, push and pull large cases across ramps and decks, I was very glad I had my High Sierra Wheeled Duffel with back pack straps. I simply unzipped the back, pulled out the straps and slung it on my back to keep both hands free as I navigated the precious route. 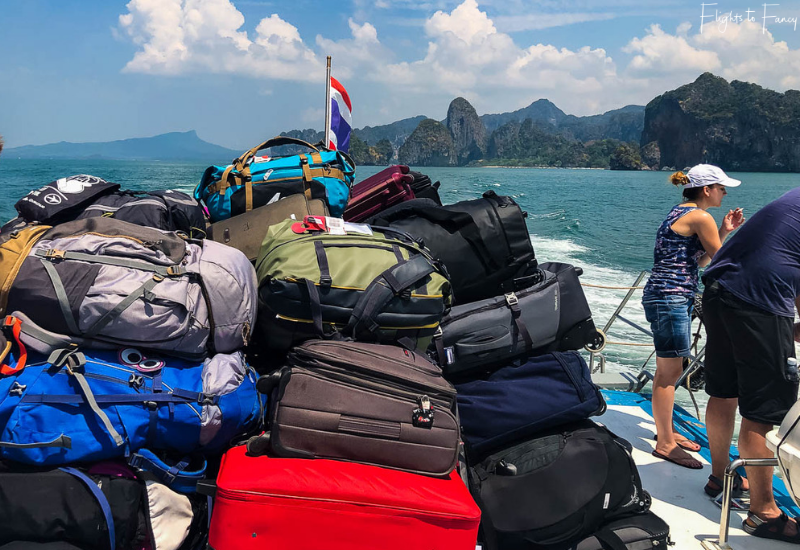 Once we made it across to the Ao Nang Princess, we were asked to store our luggage. All luggage must be left on the deck and bags are arranged by destination. Saladan Pier Koh Lanta was the last stop and our bags were therefore stored closest to the cabin door leading downstairs. Given the luggage was not secure and was handled roughly, I slipped my laptop, our snacks and our passports out before handing it over. We always travel with a collapsible backpack which folds down to barely nothing so I whipped it out and threw everything in. The ferry from Phuket to Koh Lanta had seating both upstairs and down in much the same configuration and we chose the downstairs cabin. When all the passengers were on board, we pulled out of Rassada pier slightly behind schedule at 8.40pm. Once we were underway one of the crew gave a briefing and made sure everyone knew when they were getting off. Koh Lanta was the third stop after Ao Nang and Railey Beach, both of which are in Krabi. 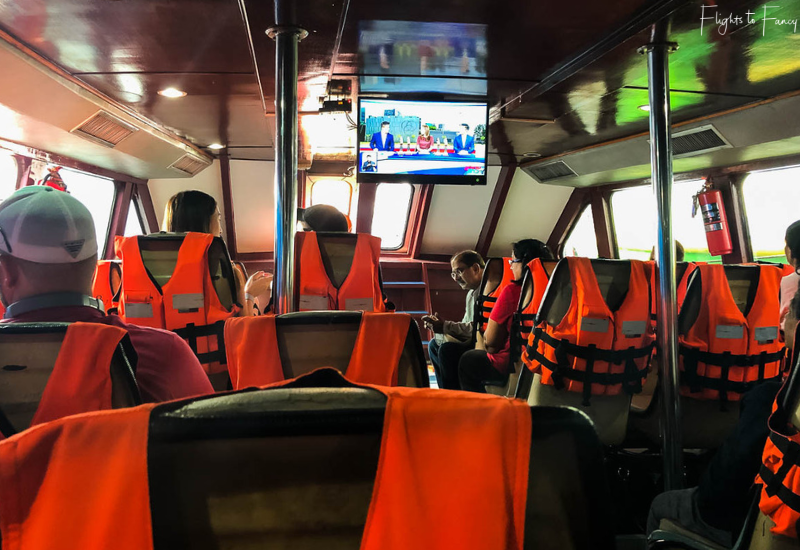 Ao Nang Princess had life jackets in easy reach on each seat and I felt about 1000 times safer than I did on our nightmare ride with Scoot Fast Cruises in Indonesia. There was a small TV at the front of the vessel that you had to duck under when walking through the centre aisle, but there was no chance of hearing anything over the drum of the engine. Luckily the mobile reception on our AIS tourist SIM held out throughout the entire trip. We only had one SIM card and I hot spotted The Hubs which really drained my battery. I was literally at 1% when we arrived. It was a muggy day and the air con was blasting in the cabin. It was a little too effective and I wished I had also grabbed a jacket out of my luggage. I consoled myself that it wasn’t as bad as the ferry we took from El Nido to Coron which was freezing. The seats were not particularly comfortable. They were bucket style making it difficult to spread across seats even though there were quite a few free. They were also quite high off the floor. My feet barely touched the ground which added to the discomfort. The seats right at the front were lower, but the rows were closer together so we stayed put. There is no seating outside, but both the upper and lower decks were strewn with people enjoying the sunshine and uninterrupted sea views. The rear deck was populated by pretty young things in bikinis, smokers and people taking pictures. I dislike being in a swimsuit at the best of times and as a three month in reformed smoker still on patches this clearly wasn’t the place for me. I snapped a couple of quick pics and scarpered. The lower deck houses the toilets and a small shop selling drinks and snacks. We bought a Coke for ฿40 which was only slightly more than on land. When moving between decks, I suggest you use the stairs at the rear. The stairs inside the cabin are incredibly steep (almost like a ladder) and getting up and down is a little tricky. After a calm voyage across the Andaman sea, we pulled into Ao Nang Pier at 10.55am where many onboard disembarked. We took the opportunity to move to a row of four, grabbing a window seat in the process. A few more passengers did board at Ao Nang, but we were well under capacity. Next stop was Railay Beach to drop off the day trippers. We were on our way again by 11.20am for the final leg of our journey. The novelty had certainly worn off at this point and we willed the boat to go faster. We arrived at Saladan Pier Koh Lanta about 30 mins behind schedule at 1.15pm. There was a mad scramble on deck as everyone tried to get their luggage. Some passengers were so determined to get their bags first that common courtesy was pushed aside and bags were dragged from the bottom without a care for the bags of others teetering precariously on the top of the pile. The fact that none went overboard is a minor miracle. We waited for the mêlée to die down a bit and made sure we had clear line of sight of our bags before we dove in. Saladan Pier was much quieter than Rassada Pier and we were the only boat berthed. Each passenger disembarking at Salandan Pier Koh Lanta must pay a ‘clean up’ fee of ‎฿10. Have you cash handy so you don’t hold up those behind you. 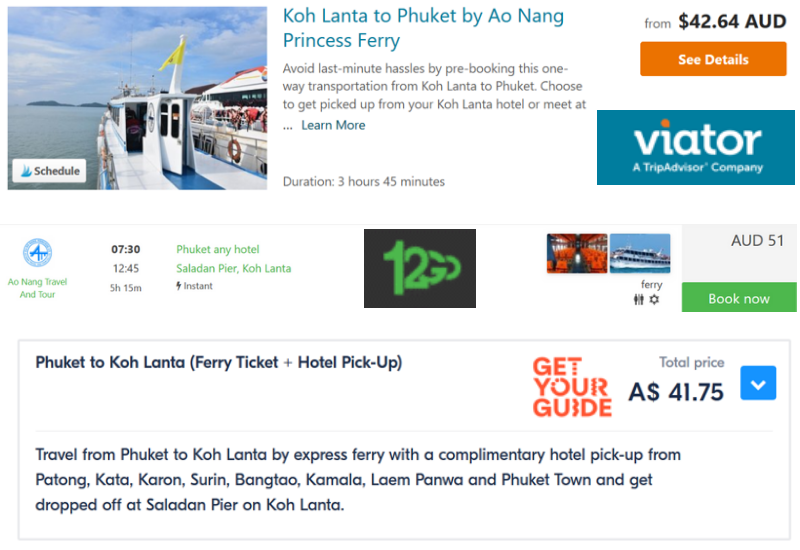 I thought a hotel transfer was included in the cost of our ferry from Phuket to Koh Lanta. I scanned all the drivers waiting with boards twice and when I failed to find our name I checked our Klook voucher. I was mistaken. 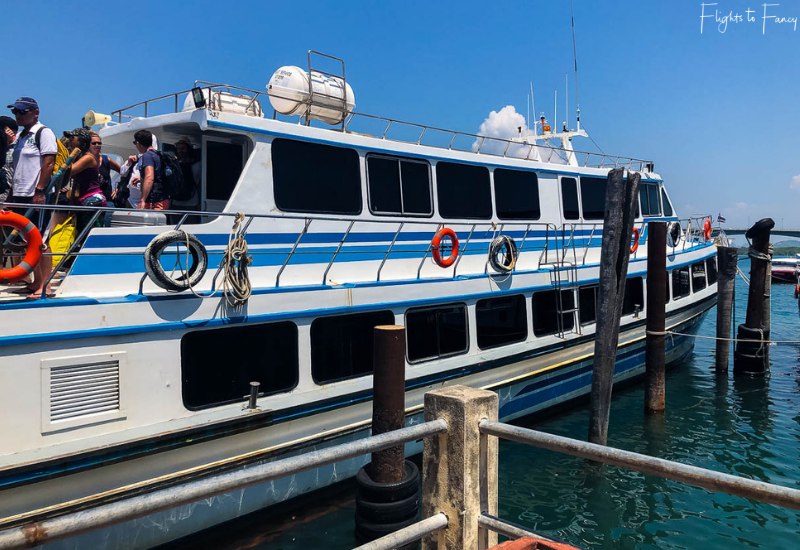 Our ticket only included a pick up on the Phuket side, however passengers that make the Koh Lanta ferry journey in the reverse direction (Saladan Pier to Rassada Pier) do get transfers at both ends. Weird, but whatever. We stepped out into the car park and prepared to do battle with the hundreds of Tuk Tuk drivers competing for our business. I had done zero research on what to pay given I though our transfer was included and prepared myself to be ripped off as only those fresh off the boat without a clue can be. Most drivers were quoting on a per person basis and we were quoted ‎฿150 each to our hotel the Lanta Sand by at least three drivers. We picked one we liked the look of and started the dance. I offered ‎฿200 in total as she accepted. It was a short 10 minute ride in the open air side car attached to a scooter and the cool breeze was most welcome in the scorching midday sun. I asked Jordan (who checked us in at out hotel) how much we should have paid for a tuk tuk from the pier. When he said ‎฿80 per person is the accepted fare to Pra-Ae Beach (Long Beach) I breathed a sigh of relief. I can live with paying ฿40 over. All said and done, our ferry from Phuket to Koh Lanta was fuss free and I have no real complaints. After three wonderful days in Koh Lanta, we also caught the Ao Nang Princess Koh Lanta to Krabi ferry. Don’t forget to book your fery with Klook a few days in advance to avoid any issues as ferries do fill up in peak season. Have you been to Koh Lanta? How did you get there? I’d love to hear your experience in the comments below. Disclosure Statement: This post is not sponsored. I paid for my ferry from Phuket to Koh Lanta in full. The information in this article is based on my own personal experiences and has not been influenced in any way by the brand(s) featured. This post may contain affiliate links which if clicked may earn me a small commission on purchases at no extra cost to you. 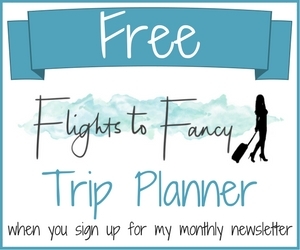 Most international trips begin with irresistible flight tickets, right? I too end up doing that. Flight ticket first then everything else. Thailand is neighbor to me but I’m yet to visit the country. It’s a weird experience with your driver indeed. Esp., in a touristy place, I’d expect some friendliness. At least the tuktuk wasn’t a total ripoff. All is well that ends well! Wow! This is a brilliant idea. I have been to Phuket a couple of times too and would love to explore the place a bit more. Thank you for sharing your experience. Will consider this during our future trips. This seems to be a good alternative to the crowded Phuket. Your detailed experience and tips on getting there are perfect for people to plan a trip to enjoy the uncrowded isle. It also, seems to be pretty reasonable in terms of costs to get there. Guess I will be considering this as the next stop instead of Phi Phi or Phuket. That was so much fun to read about your impressions, felt like being there! Actually, I made similar experiences since I visited Koh Lanta some years ago and I can confirm that things might going to happen in an own way. In my opinion Koh Lanta is definitely worth the trip since it is such beautiful island and not yet that full of mass tourism like other Thai isles, at least in the time I have been there. This is such a detailed post. 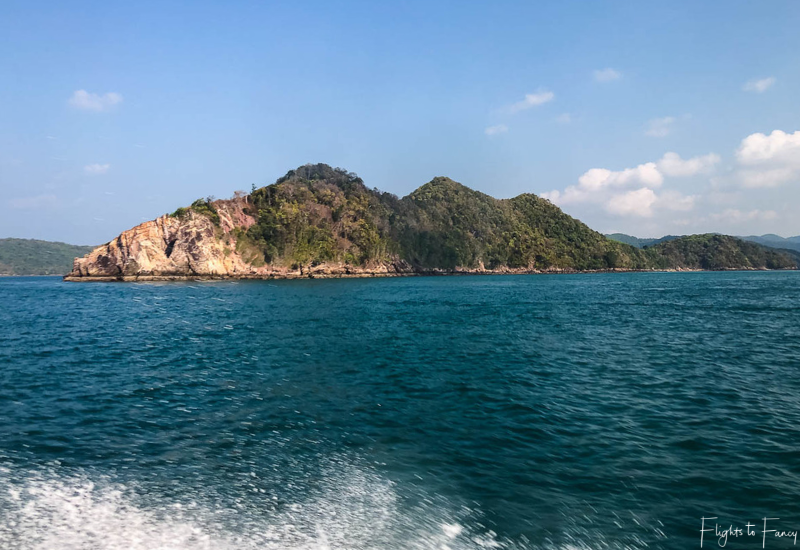 I am planning a trip to Thailand this year and was actually thinking to skip Phuket but after reading about Koh Lanta, I am interested in taking a Ferry to it from Phuket. This looks like an easy experience to book. I’ll take care to double check if my transfers are included. This is a great article. We are considering doing this journey this year. 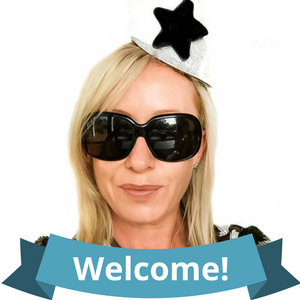 You have given us all the options and also what to look out for when booking. It is always confusing when booking ferry journeys in Thailand. This looks like a easy ferry to book and travel on. Good idea to carry an extra backpack for laptop and valuables, I would not check that in my luggage either. I really need to make it over to Thailand one of these days to explore this for myself. 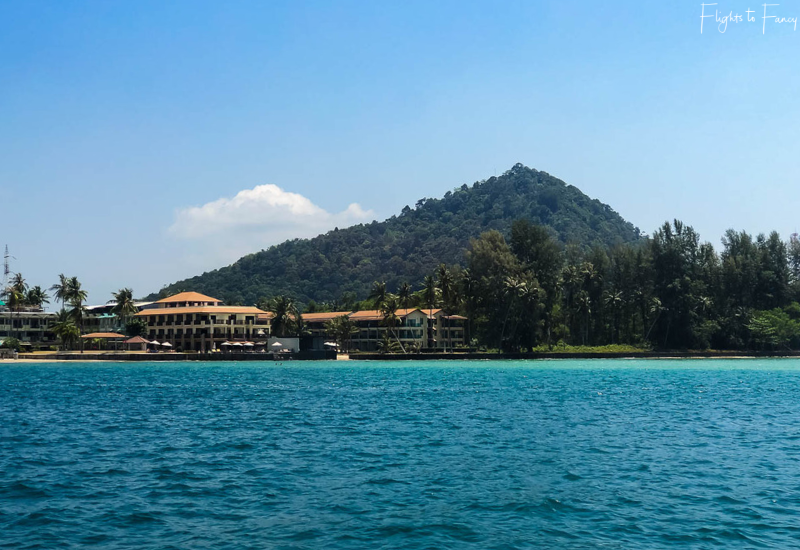 Really enjoyed reading about how you made the crossing from Phuket to Koh Lantah. On our Thailand trip last year, we skipped the beach destinations and focused on cities and national parks, but perhaps next time we’ll include one of the beaches! Good to know the different options for the ferry crossing, and costs. 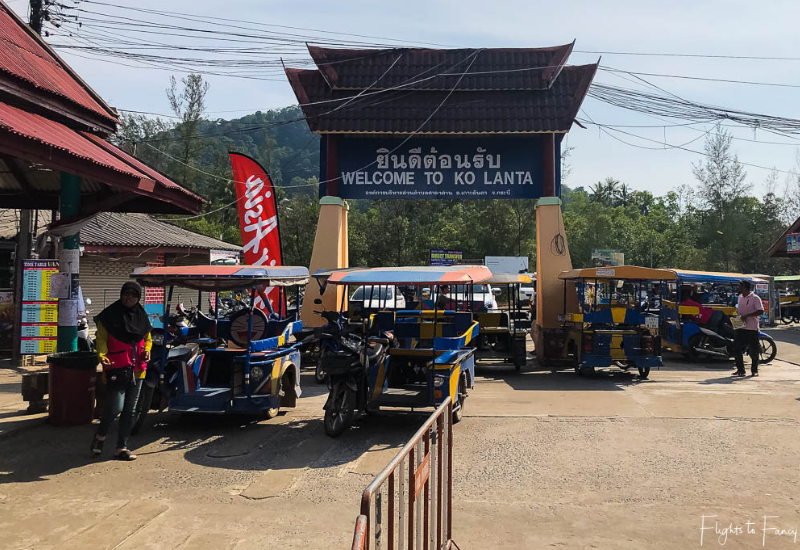 This post is full of helpful tips on how to travel around Koh Lanta. Love how briefly you described things and I think many travelers will have a good use of this post. Personally, havent been in this part of thailand and I wish to go one day and find this post again.